Has anyone seen the glasses from the giant Vidler's mascot? The store's owner says they are missing. 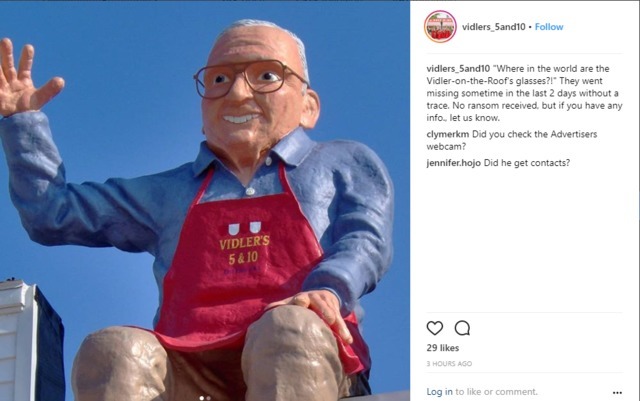 In an Instagram post , Vidler's wrote "'Where in the world are the Vidler-on-the-Roof's glasses?!' They went missing sometime in the last 2 days without a trace. No ransom received, but if you have any info., let us know." Owner Don Vidler confirmed this is no joke on his part. He said he has not contacted police, as he believes a senior prank may be to blame.